I've been feeling extremely swamped lately. Doing this food science class online has been more difficult than I anticipated, as some of the labs are quite time consuming and finding that time between my other class and my music ensembles and everyone else's needs hasn't always been easy. This unit I had one night where I stayed up until 2 am just so I could get some work done. And I had a meltdown earlier that evening because I was way over-stressed about everything. Just a few more weeks and this class will be over (fun as it is, I'm excited to reach the end of the quarter). Anyway, the third unit was on plant foods. Our first lab consisted of two exercises, enzymatic browning of apples and boiling either broccoli, cabbage, or cauliflower under various conditions (I was in the cabbage group). Turns out, lemon juice, sugar water, salt water, orange juice, and cream of tartar water are all pretty decent at preventing browning of apples, at least over a 1/2 hour time span. 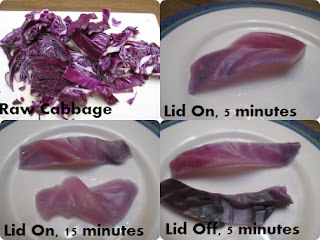 The cabbage cooking is what I stayed up late to do, and it was quite fun to try out. 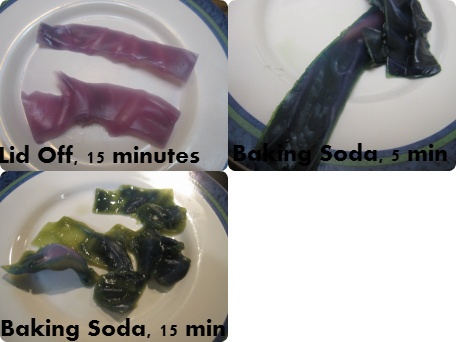 Cream of tartar slows the softening process while baking soda speeds it up. If you cooked broccoli under the same conditions, the results for the cream of tartar and baking soda would be opposite where coloring is concerned. The cream of tartar will cause the color of broccoli to fade and the baking soda will help it maintain a bright color. Obviously that wasn't the case here with the cabbage. Our second lab was all about cooking grains - either cornmeal, rolled oats, or quick oats. 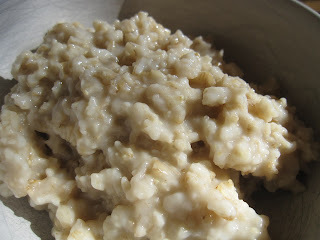 I did the rolled oats. We had to cook them by putting them in the cold water and then bringing to a boil, by adding them to the boiling water and stirring constantly, and by adding them to the boiling water and stirring occasionally. I found the cold water start to have the best flavor and the boiling water/stirring occasionally to have the worst texture and flavor. But some of that is rather subjective as there were others who did the same variation who seemed to prefer the boiling water/stirring occasionally over the others. The cold water start gives the grain a short soaking period before it reaches boiling and starts cooking, which allows the starch granules to absorb more water and swell more and reach a greater state of gelation. Our final lab was the most fun, especially from the kids' perspective. It also had two exercises, the first of which dealt with separation of starch granules. 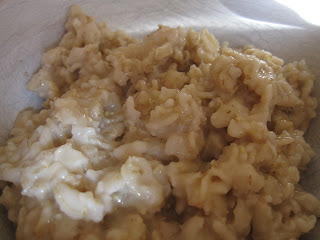 So we took flour, mixed it with various things (oil, sugar, cream of tartar, water, etc) and then added boiling water and cooked it to make a sauce. The worst part of this portion was having to taste all the variations. The one with cream of tartar was so acidic I had a hard time focusing on evaluating texture or anything else about it and nearly couldn't gag it down. The sugar variation was, somewhat predictably, the best tasting (but still not great). Those pictures are rather boring, so I won't add them here. The second exercise was to make ice cream. 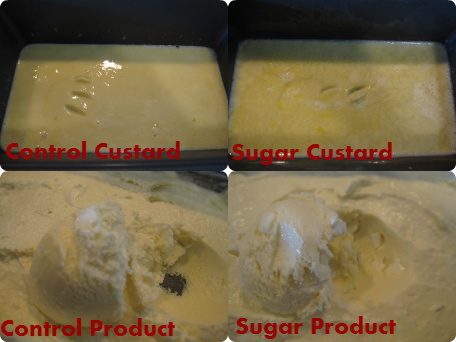 A control and one of three variations - adding vegetable oil, doubling the sugar in the custard, or only stirring twice after adding whipped cream (on the control you stirred the mixture six times). I was in the added sugar group. Obviously, adding more sugar lowers the freezing point of the mixture, so it took much longer to get the custard to a slushy frozen point and also additional time to get the product frozen. I also found it interesting to see the difference between the two custards, as the control had a smooth yellow look, while the added sugar was more mottled, with streaks of yolk throughout. 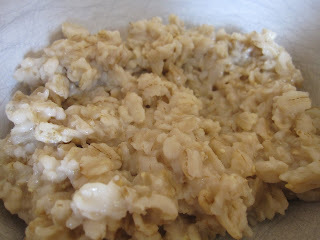 The final product was hard and crumbly for the control, as homemade ice cream tends to be, while with added sugar it was much gummier and not crumbly. The boys enjoyed getting to eat ice cream over the next few days, so they approved of this lab wholeheartedly.